Keswick Jazz festival will return for a 24th year in 2015, and the all-important festival dates have been revealed. Next year’s festival, which will see performances and events at venues across Keswick, will take place between Thursday May 7 and Sunday May 10. Amongst the venues set to be involved are Theatre by the Lake’s Main House and Studio, the Theatre Marquee in Crow Park and the Rawnsley Centre. Over the years Keswick Jazz Festival has cemented its reputation as one of the top celebrations of jazz music that the UK has to offer. A huge number of local and international acts perform at the event each year, with a number of new names set to feature at next year’s edition. This will mean Jazz Festival favourites such as John Hallam, Remi Harris and Spats Langham are to be joined on the bill by acts like Louis Louis Louis, a band who are regulars at Leeds Jazz Club and great for anyone that loves a good dance. Other acts that are new to the line-up are Mellow Tone, featuring critically acclaimed singer Mallow Baku, and TJ Johnson and his band. 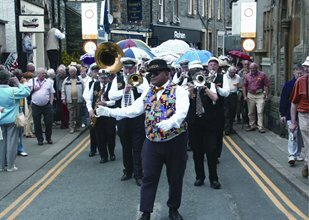 The popular Jazz Festival parade will take place on Saturday May 8, and everyone is welcome to join the musicians and dancers as they serenade the town from Market Square to the Derwentwater foreshore. There will also be a number of other free events taking place over the course of the weekend, details of which will be revealed later on in the year. Festival passes are on sale now and can be brought at www.keswickjazzfestival.co.uk or from the Theatre by the Lake Box Office on 017687 74411. To avoid frustration and disappointment book you hotel accommodation for the Keswick Jazz festival in 2015 at Hotels-Fairy.com UK’s best hotel price comparison website.